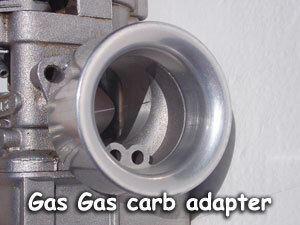 Replace the stock rubber carb adapter on the Gas Gas with our nice machined aluminum adapter. The V-Mar adapter is a bit longer than stock, making it easier to install the airbox, held on with three set screw (included) and sealed with an o-ring (also included) The inner profile is a true velocity stack shape, CNC machined to guide the air into the carb. Fits all Gas Gas trials bikes.